We’ve all heard the numbers — 35 million acres of tall fescue pastures and $1 billion in losses to the beef industry from reduced animal performance in terms of gains, reproduction, and poor overall animal health. The response from cattle producers is all over the board ranging from doing nothing to reseeding nearly all their acres to other species or novel endophyte tall fescue varieties. Public and private forage researchers have done outstanding work in finding ways to either overcome or temper the issues associated with tall fescue and its toxic ergot alkaloids. The alternatives to doing nothing are numerous and varied. 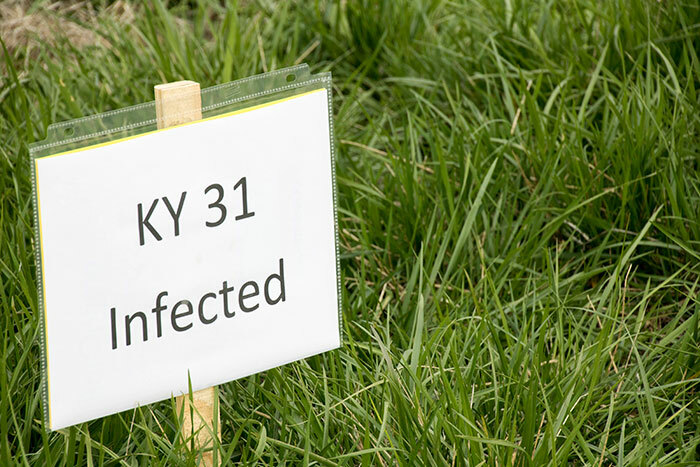 There is even an effort to identify cattle that show some tolerance to fescue toxicosis. When the summer heats up and the fescue seedheads begin to mature, as is currently the case, the potential for severe toxicosis issues reaches a peak and your options for dealing with the issue are greatly reduced. Toxins reside in high concentrations in the fescue seedhead; unfortunately, cattle like to eat seedheads. So, what are some immediate options? Giving cattle access to clean drinking water and shade is a must. Seedhead clipping is also effective, but it really should be done as soon as the first seedheads start to emerge and we’re well past that stage at this point. Clipping may still have value in stimulating vegetative growth and helping to reduce the number of occurrences of pinkeye. Research has verified that feed supplementation is also an effective means of mitigating fescue toxicosis, and I have been on several beef operations where this strategy appears to be working very well. Supplements such as distillers grains, corn gluten feed, or soy hulls are commonly used. Further improvements in performance can be realized when they’re coupled with the use of an ear implant containing a growth-promoting steroid hormone. Glen Aiken, USDA-ARS research scientist in Lexington, Ky., notes that their research measured a 70 percent improvement in average daily gains with the combination of soy hulls and steroid implants compared to pasture-only cattle. Having free-choice mineral available to cattle is always important, but especially for animals on fescue pastures during the hot days of summer. According to Jason Smith, extension beef cattle specialist with the University of Tennessee, compounds that contribute to fescue toxicosis bind to micro minerals such as zinc and copper, reducing the toxic effects to the animal. Smith also notes that producers avoid feeding trace mineralized salt in place of free-choice minerals or try to cut consumption of the mineral mix by adding salt. If you’re stuck for this year with the above limited list of mitigation strategies, start planning for future years. Most importantly, implement intensive rotational grazing to keep fescue pastures in a vegetative state for as much of the growing season as possible. This is control measure number one in terms of strategies to temper the effects of toxic fescue. Seeding a novel endophyte, nontoxic fescue variety is the Cadillac answer for eliminating fescue toxicosis, but the strategy takes time and significant capital outlay. Nevertheless, having enough novel endophyte acres to at least cover the dog days of summer can result in dramatic animal performance and offers a significant return on investment. Perhaps one of the easiest and most cost-effective strategies to offset the negative effects of toxic fescue is to incorporate legumes and other diverse grass species into fescue pastures. Species such as red clover and white (ladino) clover are popular options and help to boost protein and energy intake. One of the newest approaches for dealing with fescue toxicity is chemical seedhead suppression. Spraying toxic fescue with metsulfuron-methyl, the active ingredient in Chaparral herbicide, has shown to suppress most seedheads and keep fescue in a vegetative state. However, this must be done in the spring. Research has shown almost a 40 percent boost in average daily gains comparing treated to untreated toxic fescue pastures. Seeding a portion of acres to summer annuals for midsummer grazing is also becoming a popular approach for circumventing fescue toxicosis. Not only do species such as sorghum-sudangrass or pearl millet get cattle off of fescue during the summer, but they also thrive when many cool-season species are in summer dormancy. Tall fescue is responsible for feeding a lot of U.S. cattle, and perhaps someday there will be better options to combat its toxic effects than those listed here. In the meantime, it seems to me that the doing nothing option leaves a lot of money on the table when there are many well-researched options to do something. Whether shipped to market or grass-fed, cattle profits will always be linked to fast gains on pasture and reproductive efficiency. Toxic tall fescue limits both.